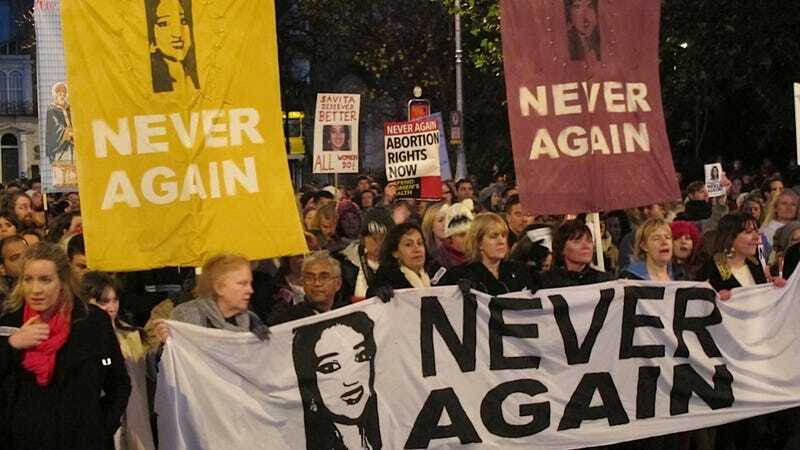 Ireland is set to open an inquest into the horrifying (and probably unnecessary) death of Savita Halappanavar, the Indian dentist who died from suspected complications from septacaemia after the hospital that admitted her reportedly refused to terminate her pregnancy. Halappanavar was 17 weeks pregnant at the time. According to the Telegraph, Savita's widower Praveen insists that the couple repeatedly requested that the hospital terminate Savita's pregnancy, but were refused because a fetal heartbeat had been detected. Praveen says he and his wife were told, by way of explanation, that Ireland is a Catholic country, which is just another way of saying, "The gestating woman dying in agony in our fine hospital is less important than the nameless fetus floating in her uterus, a fetus that will almost certainly die, one way or another." Several expert witnesses are expected to give evidence during the inquest in Galway city, scheduled for one week, including the former master of the National Maternity Hospital Dr Peter Boylan. More than 50 statements have been furnished by health chiefs and gardai for the coroner, Dr Ciaran MacLoughlin, who has promised the inquest will be transparent and open to public scrutiny. Meanwhile, the independent health watchdog Hiqa is looking into "the safety, quality and standards of services provided by the HSE to patients," particularly pregnant women like Savita Halappanavar who have the misfortune of being attended to by physicians who value a hypothetical person's life more than an agonized adult person's life.